A 19th century beechwood butter ejector print dating from c.1880. This type of cup, or ejector, print was filled with butter and then the butter was pushed out leaving a circular block of butter with a design on the top. 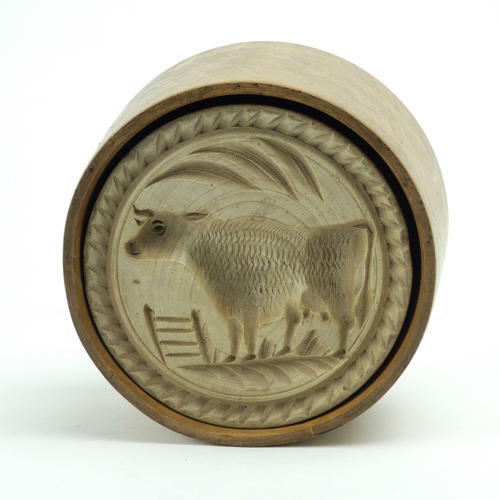 This print is very well carved with a cow, standing by a fence. The design is deeply carved, and very well detailed, and the piece is in excellent condition. The wood has a good, rich patina. On the side of the cup is an old suppliers label which advertises 'wringing and mangling machines'.